Since ancient times goddesses have played their own special role in mythology, lore, and legends across the world. These goddesses are usually known to control the duties of life such as motherhood, fertility, and love. Sometimes however these goddesses were required to multitask as they oversee death, destruction, and war as well. From 5 different parts of the world, these goddesses who inspire fear and aspiration can proudly include war amongst their skill set. 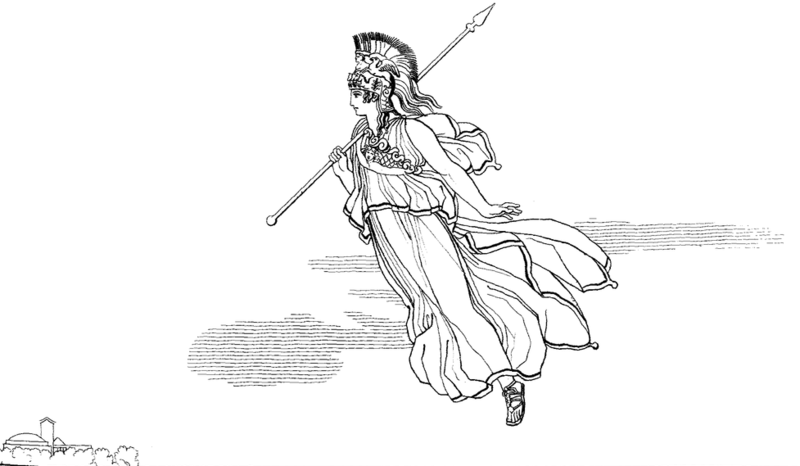 Athena is the ancient Greek goddess associated with wisdom, handicraft and war. Athena was regarded as the patron and protector of various cities across Greece, particularly the city of Athens. According to ancient Greek belief Athena oversees many important aspects of life. This included courage, inspiration, civilization, law and justice and the arts. Athena is specifically known however for her strategic skill in warfare. Athena is the daughter of Zeus and the wise goddess Metis. According to Greek mythology shortly after Zeus married his first wife Metis, he learnt of a prophecy which stated that his unborn child would try to overthrow him. To prevent this, Zeus tricked Metis into letting him swallow her whole, however it was too late as Metis had already conceived. Nine months passed by and then one day suddenly Zeus started to feel strong pain in his forehead. He asked the god blacksmith Hephaestus to treat him, obeying he used an axe opening Zeus’s forehead. Athena sprang out of her father’s head as a fully grown adult. She was wearing armour, carrying a shield and uttering warlike cries. Zeus was delighted and Athena quickly became his favourite child. Athena is most depicted in legend and artwork as a strong majestic woman, wearing a helmet and holding a spear. Athena is regarded as a warrior goddess and often used her wisdom and knowledge of warfare to help Ancient Greece’s greatest heroes. Athena aided on the construction of Argo the ship on which Jason and the Argonauts sailed. Athena gave Perseus a polished bronze shield to view Medusa’s reflection to avoid being turned to stone. According to one legend, Zeus held a contest between Athena and Poseidon for the possession of the city of Athens. Poseidon the god of the sea raised up his trident and smashed it upon the rocks, creating a salt spring. Athena offered an olive tree which could provide wood, fruit, and oil for the people. Athena won the contest and was granted Athens. Her major symbols include owls, olive trees, snakes, and the magic pendant known as the Gorgoneion. In Celtic mythology, Badb was the goddess of war chaos and death. The name Badb comes from the Celtic-Germanic word “bodou” which means “fury” or “violence”. Badb was an active participant in warfare, so much so that battlefields were sometimes referred to as “the garden of Badb”. Badb was believed to appear prior to a battle to foreshadow the extent of carnage to follow. Babi’s appearance could mean destruction of whole armies or for one specific notable person. Badb is associated with the death faery known as the Beansidhe or banshee, which shrieks a warning before someone is destined to die. Babi belonged to trio of war goddesses known as the Morrigan. The Morrigan is mainly associated with war and fate and along with Badb included her sisters Nemain or sometimes Anu and Macha. The origin for the sisters varies in mythology. According to one legend the sisters are the daughters of the mother goddess Ernma and the High King of Ireland Delbaeth. According to a different account the trio as the daughters of the druid Caitlin and his wife. Badb is also considered to be one aspect of the Triple Goddess known as the maiden, mother, and crone. In this legend Badb represents the crone who controls death, decay, and wisdom. Badb is a shapeshifter and can appear in different forms either young and beautiful or old and haggled. In some stories she appears as a woman washing the armour or clothes of those who will fall in battle. According to legends Badb along with her sisters could take the form of a raven. With her sisters she would fly over the battlefield choosing who would live or die. The souls of the deceased would be taken in their wings and flown off to the Otherworld. Badb would also directly assist her chosen side in battle. Her loud shirking created terror and confusion among enemy soldiers, feeding off the chaos. Babi was also known to take the form of a wolf, attacking with powerful teeth and jaws. Badb’s powers allowed her to cause fear in her enemies and courage in her chosen allies. 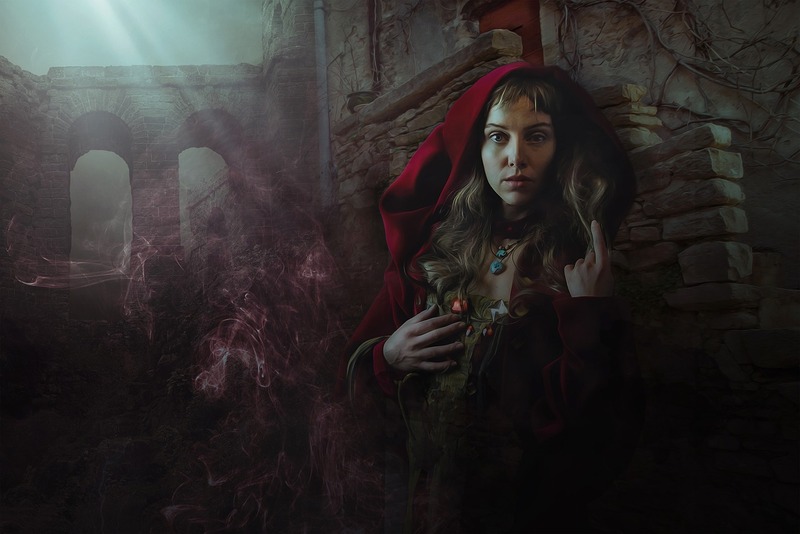 According to legend Badb has a special cauldron of the Otherworld which allows her to provide life to those who have died. Symbols for Badb includes ravens, wolves, and the cauldron. In Hinduism the goddess Durga, also known as Shakti or Devi is the form of the protective mother goddess. 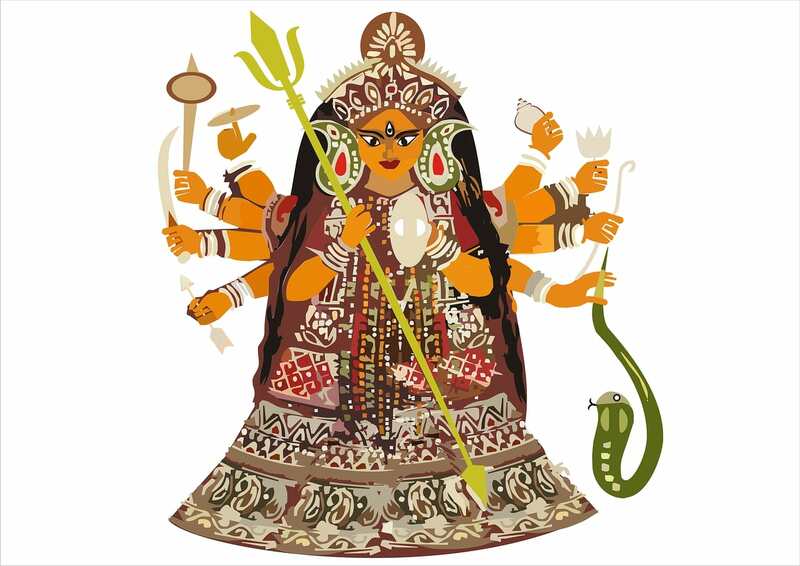 Durga combats evil forces which threaten peace, prosperity, and harmony. In Sankrit her name Durga literally translates to “impassable” or “invincible” and is related to the word Durg which means “fortress” or “something difficult to pass.” Durga is also sometimes referred to as Durgatinashini which translates to “the one who eliminates sufferings” The different reflect the deity’s protective and warrior nature. Durga is willing to unleash her anger against injustice. She remains to have significant following all over India, Bangladesh and Nepal. Durga is celebrated in her many appellations during a nine-night festival called Navaratri, each night honouring one of the goddess’s nine manifestations. According to legend the goddess Durga was created by the gods Brahma, Vishnu, Shiva, and the lesser gods. Durga’s purpose was to slay the buffalo demon Mahisasura. This demon could not be killed by a god or human, making the gods powerless to overcome him. Durga embodied the collective gods’ energy or shakti, making her more powerful than any of them. Durga was born fully grown and ready for battle. She was gifted 10 weapons from each of the gods. The weapons included a sword, bow, thunderbolt, bell, and trident. Held in her ten hands these weapons held their own individual powers and symbolism, made stronger when wielded together. Durga battled with the demon for 10 whole days and nights. Durga on the tenth day was finally able to successfully behead Mahisasura using her trident. The mother warrior goddess Durga is considered a very special deity in Hinduism. She can appear in nine different forms each of which is endowed with their own unique powers and traits for different purposes. In Hindu artwork Durga is frequently depicted as multi limbed so that she may always be ready to battle evil from any direction. She as between eight and 18 arms depending on which form has currently taken. Durga is also often shown sitting or standing on top of a tiger or lion, which represents power, will, and determination. By riding the fearsome beast, Durga symbolizes her own mastery over these qualities as she defends the world. Sekhmet the sun goddess of war and healing, is an ancient and revered Egyptian deity. Her name is derived from the Egyptian word “sekhem” which means “might” or “power”, often translated as “powerful one”. She was also known as Neser which means flame when she personified the intense of the sun. According to the Egyptian Book of the Dead, she is regarded as both a creator and destructive force, seeking justice and balance. Sekhmet was also associated with both crippling disease and healing medicine. Sekhnet was created by the Fire of Re’s eye as a weapon of vengeance and was regarded as the protector of the pharaohs, assisting them in warfare. Legends claim she was able to breath fire at enemies of the pharaoh. Sekhmet has also acquired the title “The Scarlet Lady” because of her bloodlust. Sekhmet is mentioned numerous times in spells included in The Book of the Dead as both a creative and destructive force. Her main role however is to serve as the protector of Ma’at. Ma’at refers to the ancient Egyptian concepts of truth, balance, order, harmony, law, morality and justice. There is also a goddess called Ma’at who oversees these aspects, whom Sekhnet also guarded. 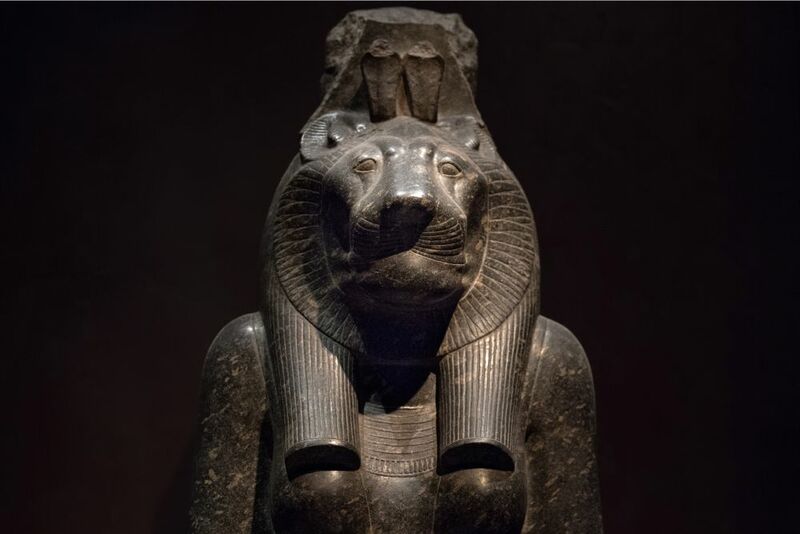 Sekhmet is depicted in her human form with a lioness head, sometimes crowned with a Solar disk. She usually holds the ankh of life when seated, when standing she holds the papyrus sceptre symbolizing lower Egypt. Some scholars believe the deity may have been introduced to Egypt from Sudan because there were more lions in that area. In one legend Sekhmet becomes the fiercest of all the gods. Seeking revenge against humans because they have not been true to the Ma’at principles, Sekhnet slaughtered many humans and drank their blood. The god Ra is only able to stop her by trickery. Ra pours 7000 jugs of beer and pomegranate juice which dyed the Nile River a blood red. Sekhmet drinks from the Nile and swiftly becomes so drunk that she sleeps for three days, returning to more docile when she awakens. Celebrations and sacrifices were often offered to the goddess to appease her and end warfare and destruction. Symbols for Sekhmet include a lioness, cobra, and fire. Freya is the Norse Goddess of love, beauty, fertility, magic, war and death. She belongs to a group of Gods known as the Vanir who were associated with nature, animals, and unseen realms. Her name Freya means “The Lady”. Old Norse sources also refer to the goddess as Gefn, Horn, Mardoll, Svr, Valfreyja, and Vanadis. There are conflicting sources, but it is believed that Freya the day Friday might be associated with her. Freya has many responsibilities including being the receiver of the slain. Freya is the daughter of Njord and his sister Nerthus and has a twin brother named Freyr. Freya is married to the God Odr and has two children with him named Hnoss and Gersimi. Freya is the leader of the Valkyries who are special women who chosen to decide who dies or lives in battle. According the Norse poem Grimnismal Freya rules over her heavenly field known as Folkvangr which translates to “field of the people”. Freya receives half the souls of those who have died in battle, with the other half going to god Odin’s better-known hall Valhalla. Freya welcomes the fallen warriors into her house Sessruminir which translates to “filled with many seats”, she even extending this hospitality to their wives and lovers. Freya is often depicted as a blue-eyed with blonde hair, wearing a Viking helmet and carrying a sword. Freya often travels via her chariot which is pulled by two black or grey cats. She is also able travel by using her cloak of falcon feathers which allows her to fly. In several legends Freya has willingly loaned out her cloak to other gods. Freya also has a “battle swine” named Hildisvini which she rides when she is not using her chariot. According to Norse myth when Freya and the Valkyries rode forth on their missions, their reflective armour creates the Northern Lights. 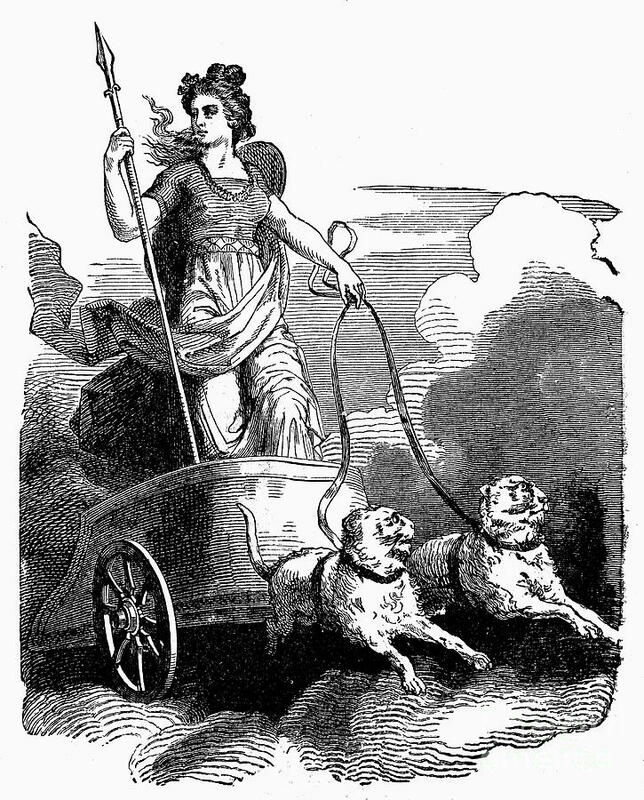 Freya is associated with symbols of divination such as runes, the wheel of fortune, spinning wheels, the moon, and cats.